With a foundation built on journalism and baseball, Nicholas F. Benton’s start in life was nothing if not all-American. At 7, he got the scoop on kiddie-news with his self-published — possibly with a little help from Mom — Benton Star. College was funded with a baseball scholarship. Come the late 1960s, with the ”Summer of Love,” assassinations of both Robert Kennedy and Martin Luther King Jr., and the Vietnam War, America was changing mightily — and carrying Benton’s sensibilities along with it. The closeted small-town boy was becoming a college-aged, gay civil-rights champion in Berkeley, Calif., and San Francisco. Though his hair may have gotten longer and clothes groovier, his love of journalism — and baseball — remained constant. But there was serendipity in that the various dots, including LaRouche, connected to bring Benton to the Washington region. Falls Church was new to him when he arrived in 1985, but something about the locale made an impression on him, convincing him to make an uncharacteristically impulsive deposit on a home there. It might not be the same as his Berkeley apartment in which Benton played host to wall-to-wall crowds during weekend-long gay parties in the early ’70s — dubbing his venue ”The People’s Alternative” — but it’s home. And there’s no doubting that Falls Church is where Benton’s heart is. METRO WEEKLY: When you look at Falls Church, what do you see? NICHOLAS F. BENTON: One of the first things I observed about Falls Church was that it didn’t have a newspaper. This was 1985. Here it is, an independent little community and you see lawn signs for various candidates for City Council, people seem to be slugging it out, and I couldn’t even tell where the city limits were. I subscribed to the paper that was around at the time, The Fairfax Journal, but still couldn’t find out anything about Falls Church. It became rather evident to me, as a newspaper person, that this was a potential place to have a paper. Falls Church is hard-wired pretty much two-thirds Democrat and one-third something else in elections. On the other hand, people are pretty conservative in their lifestyles. It has three very large churches that are very conservative that draw from far out beyond the limits of Falls Church. I found very early on, when I started the paper, in the schools, for example, they were having a difficult time getting a ”family life” education that was worth a damn. Students were writing their English essays about their ”love of the Lord,” and this kind of stuff. The advisor to the school paper at the high school, a friend of mine, almost resigned because of the flap that was created over the fact that the school paper ran an ad for [the Sexual Minority Youth Assistance League]. There was such an uproar over that. I editorialized very strongly in defense of their right to do that. That told you that even though this town was Democrat, when it came to things like this, the attitude was quite different. Falls Church has the second-highest percentage of advanced-degree holders of any city, jurisdiction, in the United States. They’re well-educated and well-plugged into the District. Most of the people in Falls Church work for law firms, lobbying firms, offices on the Hill, and are very connected, very savvy politically and so forth. You have two entities — the City of Falls Church proper, which is like 11,000 people, and greater Falls Church, which is really where our market is. It’s about 100,000 people who consider themselves to be living in something called Falls Church. That larger area is inundated heavily with Asian and Hispanic populations, in particular. MW: What’s the difference between 1985 and 2007? BENTON: In the region, of course, it’s huge. J.E.B. Stuart High School has been written up in National Geographic for having, perhaps, the most diverse student body of any high school in the country, in terms of racial minorities and so forth. A lot of the kids who are of different racial and ethnic backgrounds are actually sons and daughters of diplomats, people who come to work in Washington from different countries. The school gets exposure to a lot of different cultures from this rather rarified group of kids. I see it as my mission, so to speak, to basically open up Falls Church to more progressive thinking, embracing diversity. I made a large contribution to something that was supported by the School Board unanimously, which was to create a Diversity Affirmation Education Fund. It’s actually named after me. For the last couple of years, they’ve used that resource to bring in something called the ”Challenge Days” to the local high school. It’s an operation out of the Bay Area. In the case of Falls Church, they chose to take the entire junior class and, over a two-day period, there are exercises designed to entice these kids to really take a good hard look at themselves and their classmates and to break down the barriers of cliques and racial prejudice. MW: Based on the News-Press’ involvement in the Diversity Fund and your commitment to progressive ideals, is it fair to say your newspaper is an advocacy publication? MW: What other feedback have you gotten regarding ”Anything But Straight”? BENTON: [Laughs.] There were no burned crosses on my lawn. There was no hate mail. I actually fought those battles at an earlier stage: both with the SMYAL ad in the high school paper, then later by running an op-ed by a kid at a Falls Church middle school about his coming out. I got a flood of letters then, including from one of the leading ”ex-gay” people, Anthony Falzarano, who actually lived in Falls Church. But I slugged it out at that point. For weeks there were letters, pro and con, all precipitated by this kid’s op-ed. I went toe-to-toe with my editorials, and the town sort of picked up on it as well. There was a lot of very strong support for this kid and the paper. Then I went through a whole phase of ”duking it out,” so to speak, with the local Falls Church Episcopal Church, which has now become famous as one of those in the Episcopal denomination to defect and go with this Nigerian archbishop who says that gay people ought to be in jail. I’d been battling it out with this church for years, as the big bullies in town who try to foist their will on the rest of the community. In editorials and articles, I’d been in a pitched battle with them. By the time the Wayne Besen column started to appear in the paper, everybody was pretty much spent. By that point, I had established my credentials. Everybody in town knew that I was the crazy, wild-eyed liberal anyway. But I tell you what, I get far more people who write to me or see me in town, whom I don’t even know, who just heap their appreciation on me for the paper and for the viewpoint I represent both in my editorials and in my national-affairs column. MW: What about your personal life? BENTON: I’m single with my cat, Mimi. And my dearest friend is my ex-wife. She’s an attorney who lives in Falls Church. I like to get to Rehoboth a couple times a month. I absolutely love going there. I pay my printing bill for the newspaper with a credit card that gives me Amtrak miles, so I jump on the Acela to New York all the time without having to pay a dime. I try to go there once a month. There’s so much to do in New York. I go up there for sporting events, for shows, for concerts. I have friends up there and we’ll get together. MW: Your interests run from Broadway to baseball? BENTON: Absolutely, yes. I went to college on a baseball scholarship. MW: And you do specifically identify as gay? MW: How many times have you been married? BENTON: Married and divorced three times. I’ve just been in touch with my first wife. I went to Las Vegas, where she lives now. We had a very nice period, just talking, catching up. She’s married with a grown child. MW: Do you have any children? BENTON: No. [My second wife and I] went through a series of abortions because of our political activism. [We] decided it was not a good idea to have children. With my third wife, we sort of got away from all that, but it was a dead end in a certain way. MW: Has there ever been a man in the mix? BENTON: Nah. Good friends. And I go out and hang out in some of the clubs. I get out and have friends. But, you know…. 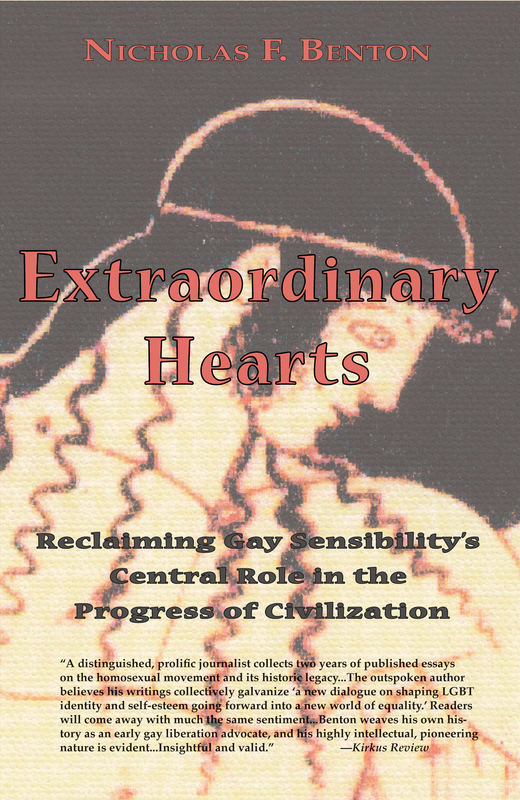 MW: Do you have a sense of gay identity beyond your gay-liberation days in Berkeley? BENTON: Yes, totally. I’m a huge supporter of a number of gay-advocacy organizations. I’m a member of the National Lesbian & Gay Journalists Association. The Virginia Partisans [Gay & Lesbian Democratic Club], I’ve supported them. I made a big effort in terms of the Commonwealth Coalition to defeat the marriage amendment last year. I’m out in the sense of being open. I think most of my political contacts and friends, like Congressman [Jim] Moran (D-Va.) and Sen. [Jim] Webb (D-Va.) and all the local politicians at the state level and local level, know that I’m identified with that. I don’t hide it in my paper at all. In fact, every once in a while I make a pretty explicit reference. But I don’t run around with it stamped on my forehead. MW: How would you say you came out? BENTON: There was no coming out in Santa Barbara, Calif. [That happened] when I went to Berkeley. I didn’t come to Berkeley being a wild-eyed radical. MW: Did coming to Berkeley to attend divinity school complicate things? BENTON: It was a very progressive divinity school, the Pacific School of Religion. At the beginning of my second year, there was a sign-up opportunity for seminary students to attend a week-long seminar to gain exposure to the gay community in San Francisco. This would’ve been the fall of ’68. It was something that started through the churches there and existing organization like the Mattachine Society and people who are legends now, like Phyllis Lyons and Del Martin. They had sessions where different leaders of the gay community would come and speak. It culminated in being invited to a drag ball. It was a big event. MW: Were you excited, maybe nervous, going into this? BENTON: Well, I knew I was gay. I pretty well knew I was gay in junior high or high school. This was an avenue for coming out. I went [to the seminars] in the closeted fashion. It was a very different world than it is today. There were no resources. One could pretty honestly say that prior to this experience, I’d never met an out gay person in my life. I got to meet these people and see that they were actually human beings and they had points of view. They were smart, and some of them were pretty cute. It sort of worked its magic on me. Then I started going over to San Francisco on my own, just to poke around, the following spring. By March of 1969, I entered my first gay bar. The one I ended up going to every night was called Rendez-Vous. It was the most popular bar, very preppy, a young crowd. Everybody just looked so hot. I wound up moving over to San Francisco for my last year of post-graduate seminary studies, [when] everything kind of got radicalized. We started getting hippies and long hair and beards and raggedy clothes. I was included in that. I did get involved in gay liberation. By the fall of 1970, I’d begun writing for the Berkeley Barb. MW: Why did you leave the Bay Area? It seems like you were very at home there. BENTON: It would be safe to say that I underwent a pretty significant burnout. I was officially co-founder of the Berkeley Gay Liberation Front chapter, so to speak. I was the first person ever invited to speak at an anti-war rally as a spokesman on behalf of the gay community. There was an element of burnout. The way I explain it is the defeat of [1972 Democratic presidential election candidate George] McGovern. There’s a coincidence between that crushing defeat and my taking a hard, left turn away from progressive, liberal ideas toward Marxist, socialist ideas. That’s the kind of direction my life took. I started representing the gay point of view in articles I wrote in the Barb. I wrote some pretty provocative stuff. Everybody knew who I was, that I was gay. I wrote one piece that was sort of my exit from gay activism: ”Homosexuality Versus Socialism.” What I did in that — and I’m not saying I agree with that point of view now, but in that day it was a different world — is I attacked the predatory nature of homosexuality: It’s dominant/submissive, it’s aggressive, it’s predatory, versus the ideal socialist society in which everybody is fully actualized as a person, and blah-blah-blah. About 1973, I just turned my back on all that and pursued what I viewed as a socialist, alternative activism focused on a lot of ideas, redistribution of wealth and large-scale energy and agricultural projects to feed the world. My focus shifted. Berkeley was a hotbed of socialist organizations and groups and demonstrations and so on. I basically wound up getting more or less attached to one that seemed to have a particularly beneficial intellectual challenge and integrity to it. I went through that whole phase. By the late 1970s, I moved out of the Bay Area, down to L.A., and started to realize that this was going sour, that this was bad news. MW: This alignment was bad news, the politics of it? BENTON: Mm-hmm. I moved to Houston to where I could focus my energy [on] development of large-scale water projects. MW: Was there a step between promoting the water projects and becoming a White House correspondent? BENTON: No. I found out it wasn’t that hard to get a pass to go in. The first time at the White House, I was in a nationally televised press conference with [President Ronald] Reagan. I was writing for something called the Executive Intelligence Review, which also published some of my other stuff about water. Next thing you know, I’m getting a hard pass to the White House and going to all the briefings, both under Reagan and subsequently under Bush senior. By 1987, I’d completely had my fill of these people I’d been working with and I started my own press service, Century News Service, which I subsequently changed to Benton Communications. I got various gigs at that point, writing for what was then the Asian Fax Newsletter Service. They paid big money for this exclusive material. Then the Japanese stock market crashed. MW: How much of a risk were you taking? BENTON: If you can believe it, I had no money. But I had a pretty good idea how you do your own newspaper. I got a list of the whole membership of the Falls Church Chamber of Commerce. I sent out letters with stamped return postcards explaining what I wanted to do. There was a box on the postcard asking, ”If we launch this newspaper, do you think you might be interested in advertising?” Two or three days later, over half the people we mailed them to had mailed back the postcard. I had a stack of these little postcards, really thick, and I literally took it to the bank. They gave me a line of credit, and the rest is history. MW: As for the future, are you hoping the News-Press will move beyond Falls Church to influence more of Virginia? BENTON: It already has. We’ll always be the community newspaper for Falls Church. We’ll never abandon that mission. [But] the vision of the News-Press for me is akin to something like the City Paper or The Village Voice. I think it needs to be said: Jim Webb is from Falls Church. If you look at the votes, where they came from, eastern Fairfax County in particular was an absolute swing factor in Webb’s election last November. And the margin that he carried in that area was so overwhelming that it basically swung the entire state for him. I’ve written about this and I sincerely believe this is true: The effort to defeat the marriage amendment backfired on the Republicans in the sense that I know personally of a number of cases of what you might call ”club kids,” apolitical gay people, who have paid no attention to politics, but because of the marriage amendment went out and voted, and in so doing also voted for Webb. Whereas I don’t think on the other side the marriage amendment brought anybody new out to vote. And the fact that the Commonwealth Coalition put up as big a fight as they did — and I’m the one who talked them into putting ads on CNN, held events for them, editorialized, donated four full-page ads in my paper…. A very credible case could be made that the fight against the marriage amendment brought Jim Webb his victory, and swung the entire U.S. Senate to the Democratic side because of his victory. Therefore, east Fairfax County, where most of this shift in voting patterns occurred, was absolutely decisive to the whole thing. I don’t want to take it much further than that, but that’s where I circulate my paper. It’s not a case of building up to some point where I can have an impact in turning Virginia ”blue.” I’ve been having an impact. It’s anybody’s guess as to how much or how little, but it’s definitely a factor. And I want to do more of that. I’ve been gratified in the period I’ve had the paper, 16 and a half years, that in Falls Church I can almost visibly see the impact that the paper has had on the community. The way in which I’ve tried to introduce more progressive [values] and greater appreciation for diversity and acceptance among my readers and among the entire community — I’ve been very gratified by that. The greatest reward is seeing the almost-physical impact of your work. That’s why I’m happy.